Pitch TV Buyers Tour is for show creators ready to pitch media execs at meetings set up by us at major TV conferences! Pitch TV Buyers Tour is a powerful combination of virtual training sessions before and after a TV pitch conference, plus Mark and Jeanne Simon will be at the conference to support you in every way possible including at the meetings with broadcast, cable, and streaming media execs we set up for you. We have Pitch TV Buyers Tour for Banff World Media Festival in June 2017. Watch this video if you want to see for yourself what Banff World Media Festival is like when you go with us. You can pitch any kind of show at the festival and Disney/ABC will be honored as the company of distinction. The Place will be packed with top-level execs from Disney and ABC. Get more face-to-face pitch meetings with TV execs than you ever thought possible! Any idea we give you is yours to use how you wish and you retain 100% ownership. Frustrated by gatekeepers and being told you need an agent or an attorney to submit your TV idea? Stop calling and emailing execs at networks who are not going to respond to you. It’s a big waste of time. We know the best way to get around the gatekeepers… go to aTV pitch conference. Most people don’t even know about TV conferences which are held several times a year for every type of show where you can pitch media buyers without an agent or an attorney. Want to pitch your TV show idea to HBO, TruTV, Discovery Networks, ABC, Amazon, Lionsgate or Nickelodeon? The only way for to you to pitch 10, 20, even 30 (35 pitches in one day is our personal record) buyers a day is to attend a major TV pitch conference where you do not need an attorney or agent. Conferences are by far the most economical, efficient and effective way to pitch and network with media execs which is why we’ve attended four to five conferences a year for the last fourteen years. Want To Know The BIGGEST DIFFERENCE Between Creators Who Sell Their Shows and Everyone Else? People who sell their shows have prepared them to meet or exceed network standards, have a dynamite pitch package, and they know how to pitch their shows effectively with confidence and enthusiasm. They also work with TV industry pros to make sure they get every element just right… and that’s where our training is vital to your success. TV is a tough, competitive business and if you’re able to get a pitch meeting you don’t want to blow it. Media buyers are eager to take your pitch as long as you don’t waste their time with a poorly executed idea or a lame pitch. You don’t want to have the door closed on you forever! 100% confident in your show, but not sure what to say in a pitch? You’ll get multiple opportunities to practice your pitch with us before and at the conferences. We’ll work with you 1-on-1 to make sure you don’t make rookie mistakes (like memorizing your pitch word for word) and help you create a pitch that makes even the most discriminating of buyers sit up and take notice. Want to stop spending $10,000, $50,000 or more on things that you don’t need to sell your show? 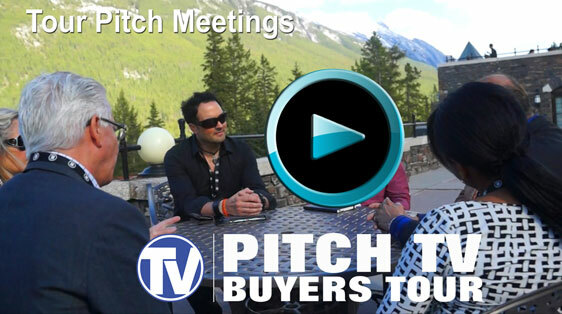 Who Should Join the Pitch TV Buyers Tour? Register for Banff World Media Festival AND book your hotel room. You start your training immediately by logging onto your Members-Only website which has an 87 page workbook with sample treatments and one sheets and much, much more. You attend all virtual training and material review sessions before the conference. No travel required! You meet us at Banff World Media Festival and pitch more top-level network execs than you ever thought possible!